The Mars of Edgar Rice Burroughs is filled with technological marvels. Earthman John Carter discovers the Martians have anti-gravity "fliers", disintegrator ray weapons, and even a great factory that maintains the atmosphere of the planet. The Martians also have advanced medicine and biological technology. Indeed the great Martian scientist Ras Thavas - known as The Master Mind of Mars - has perfected biotechnological techniques that are both fantastic and terrible. Burrough's 1939 novel Synthetic Men of Mars reveals Ras Thavas's greatest achievement: a vast army of clones. After Ras Thavas was driven from his great laboratories by Vobis Kan, Jeddak of Toonol," explained Gan Had, "he came to this island to perfect a discovery he had been working on for years. It was the creation of human beings from human tissue. He had perfected a culture in which tissue grew continuously. The growth from a tiny particle of living tissue filled an entire room in his laboratory, but it was formless. His problem was to direct this growth. He experimented with various reptiles which reproduce certain parts of their bodies, such as toes, tails, and limbs, when they are cut off; and eventually he discovered the principle. This he has applied to the control of the growth of human tissue in a highly specialized culture. From a mass of cultured undifferentiated human cells, Ras Thavas was able to grow arms, legs and eventually whole bodies. The "synthetic men", known as hormads, would all be genetically identical to both the original human cells and to each other, making them clones even though that term is never used. "In fact things seem to go all wrong without him," and when I reached the first vat room I realized that that was a crass understatement of fact. Things couldn't well have been much worse. The floor was covered with the remains of hideous monstrosities that the officers had had to have destroyed. The parts still lived. Legs were trying to walk, hands were clutching at whatever came within reach, heads were lying about screaming and moaning. So where did Burroughs find his inspiration for Ras Thavas's mad science? My guess is that he was influenced, at least in part, by the research of French biologist and surgeon Alexis Carrel. In 1912 Carrel took a piece of embryonic chicken heart and placed it in a flask with nutrients. He successfully cultured the cells for decades, a feat that caught the public's imagination. In the 1930s Carrel (along with aviator Charles Lindbergh) went on to develop techniques that allowed human organs to be kept alive outside the body during surgery. This achievement was also celebrated in popular culture, with Carrel appearing on the cover of Time Magazine in 1938. Carrel's achievements inspired a number of writers during science fiction's "Golden Age", from Arch Oobler's 1937 radio play "Chicken Heart" in which cultured cells escape the lab and threaten to engulf the world, to the "Chicken Little" food source in Pohl and Kornbluth's The Space Merchants. The ever-growing human cells in Synthetic Men of Mars fits right in with these stories. But science doesn't really play a central role in Burroughs' novels. Instead science and technology and unusual creatures are a backdrop for the real story, which usually involves a fight (or three) and romance. In Synthetic Men, it turns out that some of the hormads are quite intelligent, and they gather their brethren into an army in hopes of conquering the world. The hero - in this case the Martian Vor Daj - and John Carter work together to destroy the terrible mass of tissue and hormads run amok. And Vor Daj finds love, despite having his brain transplanted into an ugly hormad body. ERBzine has a detailed review, along with a great collection of covers from different editions of Synthetic Men of Mars. Very good post. A lot of people forget just how imaginative ERB was. I don't think he ever really believed that Mars was as he wrote. He just developed a good playground and went to work in it. I remember reading that novel as a child, as the descriptions of the tissue vats were really creepy. Now I use something similar in my own pieces of fiction, though not for the sinister purposes of the mastermind. But using a vat of tissue with no attached nervous system to grow chicken or beef might be an efficient and humane way to keep the carnivores among us happy. 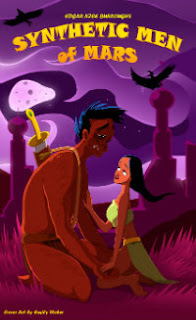 I think you're right that ERB's Barsoom was meant to be a fantastic setting for romantic adventures. But that doesn't mean ERB's settings weren't influenced by news in the real world. Regarding growing chicken meat in vats: my understanding is that muscle fibers don't really grow the same way without electrical stimulation, which means that vat meat has a weird slimy texture. Sounds kind of gross.